The truth about the process of branding couldn’t be simpler: It is the process of defining or refining your focus; who you are, what makes you different, and what unique value you offer. Then, once defined or refined, being intentional and strategic about making that tangible for people not just in logos and design, but in what you say and—more importantly—do. That simple definition doesn’t mean it’s easy to conduct a brand strategy process, especially on your own. There are many steps, exercises, tools, and skills that can contribute. But the basic goal and stages of a brand process are easier to understand than you might think. Let’s break down the Gist Brands process. A little hard to read? 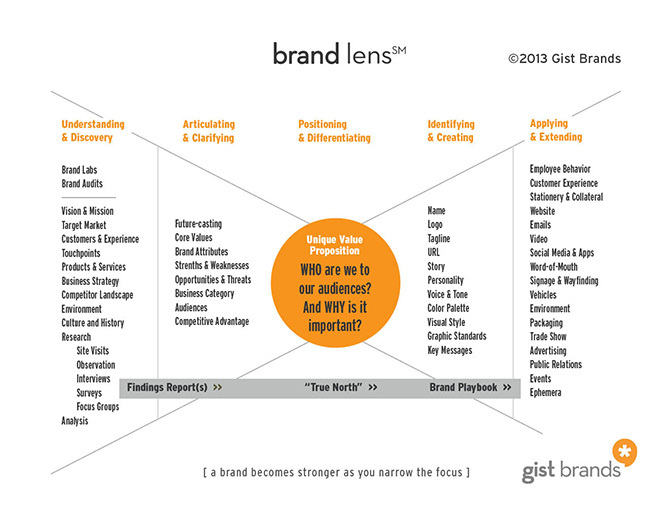 No, you don’t need your cheaters, just view a larger PDF of the Brand Lens diagram. I call my personal approach to the branding process the Brand Lens(SM). The meaning of the name is twofold. First, it’s really difficult for organizations to have the long-range view, objectivity, and rigor to take themselves through a branding process alone. My role is to serve as an outside lens to give fresh perspective. Second, I see a high-powered lens as a really powerful metaphor for the critical juncture of the branding process: Developing your unique value proposition. Everything up to that point gets distilled and focused into the value proposition (and your strategy), and all of the tangible and powerful expressions of your brand (including your logo) are informed by and radiate out from it. Note that everything on the left side of the diagram is internal focused, and everything on the right side external focused. Your value proposition is the critical connection between the two. Now that we understand the general relationships, let’s break down each step. Every branding process should include some aspect of discovery. It’s not just important for a branding consultant or agency to better understand who you are, but it’s also for you to better understand who you are, even if you think you know. How we talk and what we assume about ourselves is frequently very different from how our customers talk about us or what they know. And ultimately they are who will define your brand, we just want to help shape it in their minds. In addition to customer research, the discovery stage may include conducting a brand audit to benchmark your current state; and examining your corporate history and culture, industry environment, competitor landscape, reason for being (mission), and plans for the future (vision). If you have strategic documents like a business plan or results of a customer satisfaction survey, you’ll have a leg up. This is where the data and context you’ve gathered gets distilled and turns into words and strategy to shape where the business is now and where it is you want to go. It’s where we try to articulate “squishy” things (like values and corporate personality attributes) into real words and strategic statements, refining the choice of words to make them the most accurate and powerful. It’s where we look at all your audiences (not just customers) and figure out what’s important to them. And it’s where we tease out your competitive advantage. This stage is the key to your new brand definition or brand evolution. It’s where we look at you in comparison to your competitors and define your unique value proposition: the description of the unique benefit you provide. It’s what sets you apart from the competition and guides your outreach through branding, marketing, and messaging. An articulated value proposition, along with your other strategic statements, becomes a roadmap or “true north” to guide you in business decision-making and evaluating your future opportunities. This is the “fun” and creative stage of expressing your personality and positioning. It’s no wonder most people want to jump straight here without doing the introspective homework of brand strategy (Stages 1 through 3.) But without doing the homework, what is it based on? It’s likely just an esthetic exercise. But with the articulation, positioning, and differentiation done and consensus on what the company or organization stands for, all of these creative assets can be that much more descriptive, powerful, and strategically aligned. The logo becomes just the tip of the iceberg of deep meaning throughout the organization; the tagline expresses a significant point of your value proposition; and the visual style and copy voice and tone are all cohesive to your values and brand personality. Everything is working together now toward a common goal. This is where the pedal hits the metal in building out and activating your new brand. Some of the obvious applications are designed deliverables like websites, signage, business cards, and packaging. However some of the most critical to the success of your business are things like shaping employee behavior and the actual customer experience. These are things that are only tangentially affected or enhanced by your logo and color choice, but hugely impacted by your earlier articulation of core values, personality attributes, and competitive advantage. Likewise, the messaging, strategy, and content of your brand identity likely play a more powerful role in shaping word-of-mouth, video, social media, and public relations than design or your logo will. These five stages are each critical to building your final brand strategy and brand identity. Unfortunately, most people spend much more time on the last two stages and sometimes totally ignore the truly powerful and business-shaping aspects of Stages 1 through 3. When great strategy and articulation informs creativity, and when your value proposition and messaging are designed to benefit and resonate with your customers, the light bulbs really start to go on across the organization and with strategic partners. And more importantly, with customers.